Lisa qualified at Edinburgh Telford College in 2006 and also studied at Glasgow vet school. She joined Inshes Vets in January 2006. 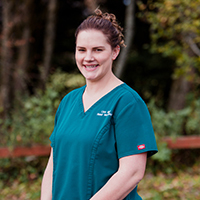 Lisa has worked in a mixed large animal practice in the Highlands. She is also a qualified Assessor - training vet nurse students and has now qualified as a Dog Groomer.